The August Monetary Policy Statement was the most influential yet under new Governor Adrian Orr, even though there was no change to the official cash rate (OCR). Orr pushed out expectations for a rates hike until 2020, sending the New Zealand dollar sharply lower. But it was the Governor’s assertion that rates could and would move lower, if weak indicators persist, that is both his biggest warning and most questionable stance. These assumptions of full pass-through underpinning a cut to the OCR are shaky given recent history, and we think the Reserve Bank would be wiser to stockpile its ammunition for a global shock instead. Infometrics currently forecasts that economic growth will soften, but we don’t believe the Reserve Bank would react with such immediate action on interest rates given the lack of pass-through. The Reserve Bank has implied that they expect retail banks will pass through the entire rates cut to investors (and savers). However, recent evidence on the pass-through shows exactly the opposite. 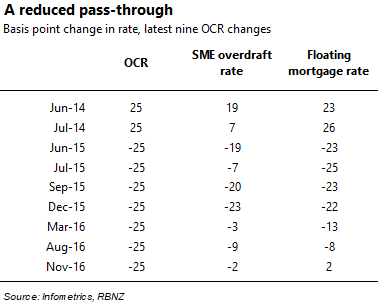 Of the nine OCR changes over the past four years, six have seen an average 95% pass-through of the cut in changes to the floating mortgage rate. The remaining three have seen much lower pass-through rates, with the most recent change in November 2016 (a 25 basis points cut) actually coinciding with a 2 basis points rise in the floating rate. 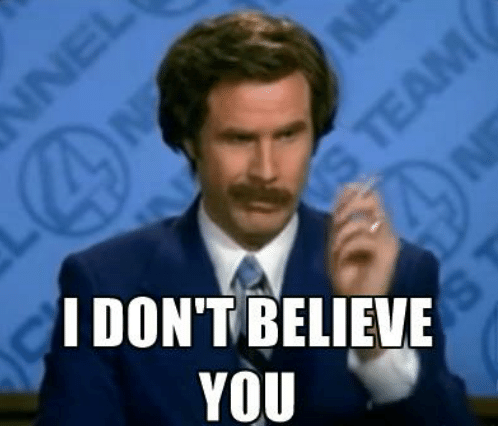 The Reserve Bank’s implicit assertion in their scenario of a 100 basis points cut to the OCR, of a full pass-through into retail rates, is hard to swallow given the last few changes to the OCR. Adding further weight to the apparent influence of “non-OCR” factors on retail rates is the fact that the gap between the OCR and retail rates has widened in the last year (see Graph 2). So why the change in pass-through in the last three cuts enacted by the Bank? One possible reason might be that as we get closer to the point where the OCR reaches 0% or turns negative, it becomes less powerful as a tool to reduce bank costs. For example, since 2010 the Reserve Bank has set a minimum core funding ratio (CFR), which currently stands at 75%. This CFR requires banks to hold a certain level of funds as a proportion of their lending, making their ability to lend dependent on their ability to access deposits. Add to this the requirement for banks to hold a proportion of their funding domestically, and banks are effectively forced to pay deposit rates that attract domestic funds, meaning lending rates cannot go too far lower. Given the evidence from the most recent OCR moves, the viability of 100% pass through of a 100 basis points cut is doubtful. It’s also important to remember the role monetary policy can play in the event of an external shock to New Zealand. The ability to drop the OCR to stimulate consumption and investment when external forces hurt growth is an orthodox monetary policy response. But the dynamics of monetary policy in the event of a shock have changed – NZ now has a low OCR and only has 175 basis points to spend before reaching zero. That scope is less far below the room we had to manoeuvre in the last external shock – the OCR is now 650 basis points below the pre- Global Financial Crisis high in 2008. Holding rates at current levels would also tie monetary and fiscal policy together better to allow for coordination. At the moment, the government is holding to its debt-to-GDP target of 20% and keeping a lid on additional spending even though borrowing costs are low. The government is holding back partly to “save for a rainy day” by retaining fiscal headroom to increase government spending through debt in case of an external shock. Given this restraint, it makes sense for the Reserve Bank to do that same and retain its ability to cut the OCR if an external shock appears and harms growth prospects. Cutting rates now risks losing half the firepower before the war starts. A potential for a lack of pass-through in any interest rate cuts, coupled with a want for monetary and fiscal coordination, sets out a clear reason for the Reserve Bank to hold the OCR over the next year. We’d expect interest rates remain at low levels but might not dip much further. *Brad Olsen is an economist at Infometrics. This article was first published here and is used with permission. Seems like the RBNZ might have to change its stance if a shock were to effect confidence in banks, who's going to put their money on TD for <2.5% if they think they might be part of a bail in? How much lower can mortgage rates effectively go? I can't find anything saying they went below 3% in countries with ZIRP. I'd say the ammo is already critically low, the RBNZ should have raised rates in 2016-2017 when the economy was a 'rock star' as it would have helped with the housing inflation also. Hind sights a great thing. Can still get 2yr fixed mortgage rates in the UK for < 1.6% per annum. Lowest rate I have recently seen was 1.14% fixed for 2 years. Well guess that means the next housing inflation boom here is just around the corner. So their fixed mortgage rates are lower than CPI inflation quite substantially. From what I am seeing on uk.deposits.org you can get term deposit rates higher than fixed mortgage rates? How does that work for banks? I think I'm even more concerned about the state of the worlds financial system now! Thanks for making me look into it further. I'm surprised at the lack of coverage of the interest rates increasing in Australia considering the name of this site. Do we not think that is important or that NZ rates will increase if they are already increasing over the ditch? The Aussies seem to be in a real pickle atm and will likely see continuing trends of tighter credit, higher rates and lower houses prices by the looks of things. Would be good to see some discussion of the likely impacts here in NZ. Looks like both economies are in a downward trend with mainly poor indications although nothing dramatic. As the graph shows, our banks have simply used the lower ocr to grab more margin. Hence record profits. It also gives them plenty of wriggle room. Aussie lenders have not enjoyed such margins at least partly due to competition from securitized lending options over there.